Set up a still-life with 6-10 similarly sized objects, each compact in shape. The background should be unfussy but not entirely plain. 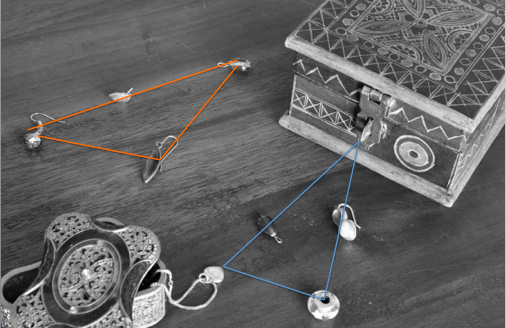 Add one object to the arrangement at a time, recording each position with the camera. The aim is to produce a final grouping, which is not so obvious as to appear boring, but hangs together visually. In the previous exercise I looked at positioning a single point in the frame. By introducing more points into the frame, imaginary optical lines connecting the points are created. These imaginary lines can also create implied shapes. I decided quite quickly to use earrings and other small jewellery beads as the ‘points ‘ for this exercise. Deciding on the background and arrangement took much more time. I found out as Freeman (2007) states that when positioning several objects the order and placement can be very demanding. I rearranged the still-life and points many times before I decided upon the composition below. I fixed the camera onto a tripod and pointed it down to face the tabletop. I arranged two small jewellery boxes to add some context to photograph. I positioned the boxes at opposite diagonal corners with a small pendant spilling from one. This was to be my initial point. It wasn’t until later that I realised that the placement of the boxes had created an implied diagonal across the frame. I then began to add additional points, one at a time. I was aware at the time that I wanted to create an arrangement that suggested the pieces of jewellery had spilled over from the boxes but I consciously avoided placing the points too close together as I wanted the details in each piece to still be seen. I was aware at this stage that the point had formed a line, so I placed the fourth point in the, as yet empty, space in front of the large box. I didn’t realise until I looked at the photographs later that this had created a triangle. At this step positioning the points required quite a lot of thought and I tried several different options before selecting this arrangement for points 7 and 8. On studying the final photograph, I noted several ‘lines’ and ‘shapes’ that the points had created. More than I was aware of while positioning the points and taking the photographs. On first viewing I noticed that 2 strong triangle shapes had emerged. 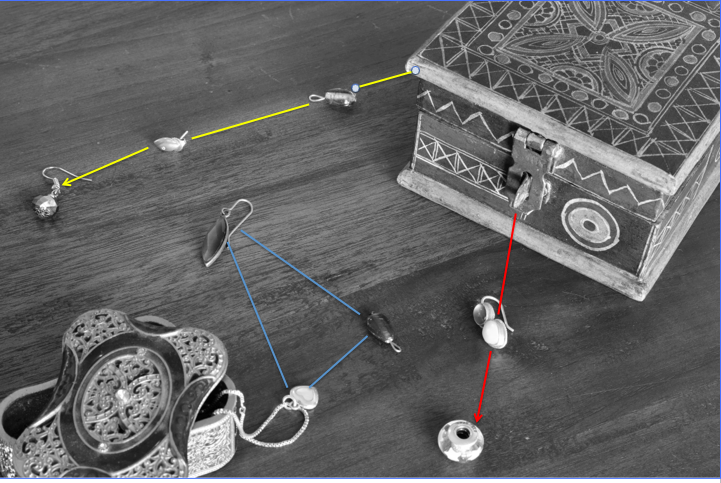 Interestingly, one of the triangle sides is created by an implied line from the pendant to the hasp on the larger jewellery box, which I hadn’t considered to be a point while arranging the composition. On further reflection I also noticed that I had unconsciously continued the diagonal line created by the larger box (see yellow line). This seems to have acted lie a boundary line, as I haven’t placed and points beyond it. Similarly with the red line, which reaches from the hasp towards the earring and bead. In between these 2 lines a triangle has been formed. While working on this exercise I read the discussion by Freeman (2007) on Gestalt laws of organisation and found it useful in understanding the way that graphic elements in photographs, such as points, are interpreted by viewers. In particular, I could see where the Law of Closure- elements roughly grouped together are seen to complete an outline shape and the Law of Simplicity-the mind lean towards visual explanations that are simple; simple lines, curves and shapes are preferred, along with symmetry and balance have been applied as I carried out this exercise. This exercise has been valuable, as it has shown me that it is difficult to achieve a natural looking still-life composition. However, being aware of the perceived lines that assembled objects create will help me in creating cohesive arrangements. This entry was posted in 09b-Multiple points on December 17, 2012 by catherinefinniganphotography.